Early detection is a key element in the successful treatment of skin cancers, and soon there may be an app for that too. Scientists at the University of Houston are working to develop an automated decision-support system with a graphical user interface for Apple iPhones that can facilitate physician diagnosis and help with early detection of skin cancer and in particular, malignant melanoma. This sounds theoretically simple. Just snap a photo of a suspicious mole or lesion with your phone and run it through an embedded software program to find out within a few seconds if it is likely to be cancerous. Enabling individual smartphone users to do that could make quick and inexpensive skin cancer screening a reality for millions of people — especially those who lack access to medical specialists. The app, called DermoScreen, is being developed by Dr. George Zouridakis, a professor of engineering technology, who has been working on the project since 2005. Dr. Zouridkis changed the project’s objective to development of a mobile phone application after the iPhone, first released in 2007, quickly became ubiquitous. The goal remains provision of quick screening in rural areas and/or in the developing world, where specialty medical care generally isn’t available, he explains in a UH release. 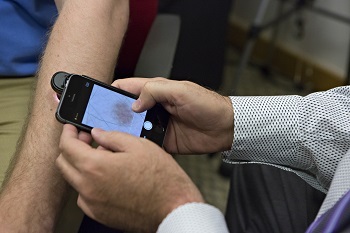 Photo caption; UH’s Dr. George Zouridakis is developing an iPhone app to quickly screen for melanoma. DermoScreen is currently being evaluated for further testing at the University of Texas MD Anderson Cancer Center in Houston. Early testing found the device to be accurate about 85 percent of the time, Dr. Zouridakis notes. That’s similar to the accuracy rate for dermatologists and actually more accurate than primary care physicians typically achieve. Patients would be referred for follow-up if a skin lesion is suspected to be cancerous. In addition to the mobile phone, the technology uses a dermoscope attachment, a special magnifying lens, which costs about $500 and provides special illumination of the area being photographed. UH says DermoScreen could be commercialized soon, and that investors began expressing interest more than a year ago after a student team from the University’s Wolff Center for Entrepreneurship produced a business plan that won the $60,000 (plus $1,000 of Amazon Web services credit) Grand Prize at the 2013 California Dreamin’ National Business Plan Competition and successfully pitched it in competitions around the country. But Dr. Zouridakis, who has additional UH faculty appointments in electrical and computer engineering and in computer science, wanted to wait, both to pursue other diagnostic uses for the technology and to ensure that it was as accurate as possible. The testing at MD Anderson is a step toward the latter goal, he says. However, don’t be searching on the Apple App Store for DermoScreen just yet. Dr. Ana Ciurea, assistant professor of dermatology and Associate Medical Director of the Cancer Prevention Clinic, Department of Dermatology at MD Anderson, one of whose research specialties is Malignant Melanoma, says the project is in the early stages. Research into other uses of the technology continues. A $412,500 grant from the National Institutes of Health allowed testing of the device’s ability to screen for Buruli ulcer, a flesh-eating bacterial disease, in Africa. For more on that topic click here. A patent has been issued for the software and related technology used to diagnose melanoma, which is the most dangerous type of skin cancer., and the leading cause of death from skin disease. Melanoma develops when skin cells become abnormal and multiply, usually because of too much exposure to the sun. The disease is caused by changes in cells called melanocytes, which produce a skin pigment called melanin, which is responsible for skin and hair color. It can appear on normal skin, or it may begin as a mole or other area that has changed in appearance. Some moles that are present at birth may develop into melanomas. Melanoma can also involve the colored part of the eye. Dr. Keith Lancaster, instructional assistant professor in the UH College of Technology, is working on the project with Dr. Zouridakis, helping to upgrade the software so it can handle the different diagnostic components. A longtime professional in the software industry before returning to academia to earn his Ph.D., Dr. Lancaster says his work involves “training” the software to allow it to make certain decisions after reading an image. Dr. Zouridakis describes the DermoScreen development program is “an intersection” of engineering, physics, biology, computer science and medicine. University of Texas MD Anderson Cancer Centerlement in successfully treating skin cancers, and soon there may be an app for that too. Scientists at the University of Houston are working to develop an automated decision-support system with a graphical user interface for Apple iPhones that can facilitate physician diagnosis and help with early detection of skin cancer and in particular of malignant melanoma. In addition to a mobile phone, the technology uses a dermoscope attachment, a special magnifying lens, which costs about $500 and provides special illumination of the area being photographed.